Membrane trafficking encompasses the wide variety of processes that go into the movement of cargo (typically proteins, pathogens and other macromolecules) using membrane bound transport vesicles. This transport can take place within different organelles in the same cell, or across the cell membrane to and from the extracellular environment. Much like a parcel sorting office, the cell uses a complex, highly regulated system to make sure that the right cargo is delivered to the correct location . Membrane trafficking can be divided into two basic pathways based on the direction of travel, exocytosis and endocytosis. Exocytosis refers to the movement of cargo to the plasma membrane or out of the cell. As part of the biosynthetic-secretory pathway, newly synthesized proteins, lipids or carbohydrates move from the endoplasmic reticulum (ER) via the Golgi to the cell membrane or extracellular space. Conversely, endocytosis is the movement of cargo into the cell from the plasma membrane. This can be often used for the uptake of nutrients which cannot be synthesized by the cell, such as vitamins, cholesterol and iron. Another important function of the endocytic pathway is to direct cargo for recycling or degradation via autophagy. 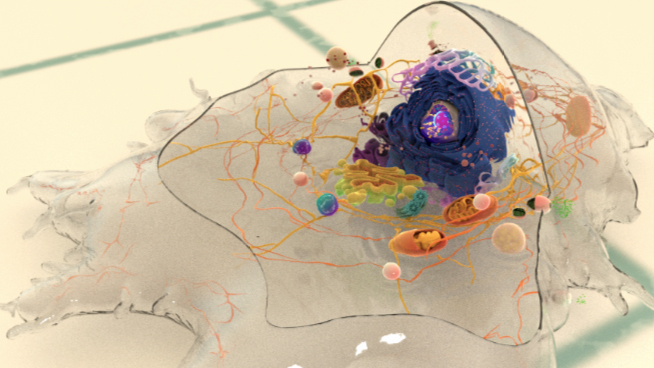 The cell can also use large scale endocytic mechanisms such as phagocytosis and macropinocytosis to internalise pathogens and external particles in order to maintain an immune response. 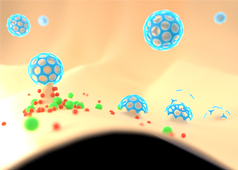 Both endocytosis and exocytosis utilize small compartments of membrane to enclose their cargo. These transport vesicles bud off from one membrane and can dynamically fuse with other membranes, or split up into smaller vesicles by fission. Residing within the interior, or lumen, of the transport vesicles, the cargo is protected from the cytoplasm. As the lumen of transport vesicles is physiologically similar to other membrane bound organelles and the extracellular space, transfer of cargo does not require movement across a membrane, simply fusion between vesicles. Transport vesicles differ from one another in the type of cargo they ferry from one site to another, the route they take, and the presence or absence of proteins on the cytosolic surface, which can form a coat. These coat proteins self-assemble on the membrane, helping to collect and concentrate the vesicle cargo. There are three well-characterised coat proteins, which coat vesicles at various points during endocytosis and exocytosis. Clathrin-coated vesicles mediate endocytosis from the plasma membrane to endosomal compartments and the Golgi. The next steps in endocytosis, namely retrograde transport within the Golgi and towards the ER, occurs via vesicles surrounded with coat protein I (COPI). In the opposite direction, COPII vesicles bud off from the ER in the secretory or exocytic pathway towards the Golgi , , , . Caveolae, which are small bulb-shaped plasma membrane invaginations that mediate endocytosis in a clathrin independent manner, also possess a less prominent, but definitive, striated coat made up of two protein complexes-caveolins and cavins. 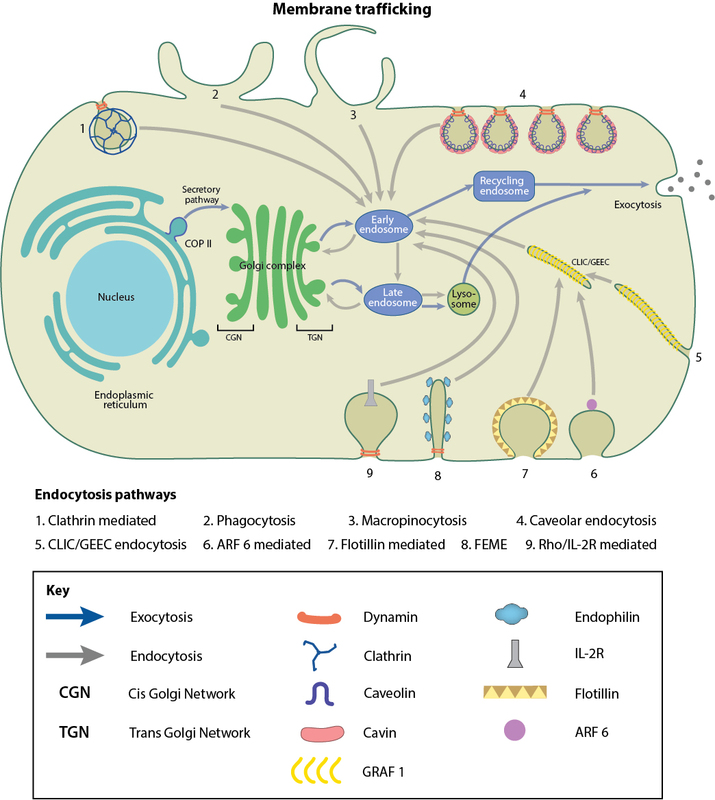 Other clathrin-independent endocytic pathways which utilize vesicles devoid of coat proteins have been described, mainly, the CLIC/GEEC pathway, RhoA-dependent pathway, Arf6-dependent pathway and Flotillin-dependent pathway. Once the coated vesicle bud grows and is ready to detach, it has to be separated from the membrane of origin without loss of cargo. In some cases, the detachment of budded vesicles from the plasma membrane may be facilitated by the GTPase Dynamin, via membrane scission. Dynamins associate at the neck of the budding vesicle, and fuse the two lipid bilayers together in a GTP-dependent process, thereby cutting the neck and releasing the vesicle from the membrane. In order to bend the membrane to promote or discourage scission, BAR, N-BAR and F-BAR domain proteins affect membrane curvature, either promoting or discouraging the likelihood of membrane scission , . The cytoskeleton is responsible for moving vesicles throughout the cell. Most vesicles traffic along microtubules using kinesin or dynein motors, although they can also use myosin II and Myosin V motors to move along the actin network , . In order to determine the correct location for delivery of cargo, the transport vesicle needs to be able to recognise a specific target. Members of the Rab small GTPase family are primarily responsible for providing this specificity. Rab proteins can be expressed on both transport vesicles and target membranes, providing a further level of regulation. SNARE proteins dock the transport vesicle at the correct membrane location and catalyse membrane fusion, the final step in cargo delivery. SNAREs bring the apposing membranes of the transport vesicle and the target region closely together so that the lipids from the different bilayers can mix, and this eventually results in fusion, and the release of cargo , .